Similar to an animal’s bone structure, house framing acts as a skeleton to support and protect the interior and exterior of a home. If the house framing is constructed properly a home should be able to last many decades and possibly much longer. There are many wood framed buildings that are hundreds of years old. On the flip side, improper house framing results in both immediate and long term problems, and as a result the life of the home is usually shortened. An improperly framed house creates immediate problems for the other subcontractors associated with completing the home. Crooked walls and insufficient blocking, for example, create difficulties for both the drywall and finish carpentry contractors. Though they can frequently adjust for the poor house framing, it takes them more time and more of your money to do so. In addition, compromises in the home are always inevitable. 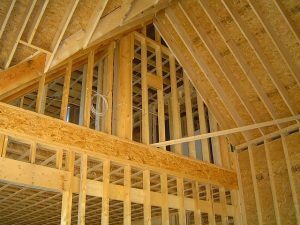 Prior to starting a house framing project it is important that you understand the local building and fire codes, and ensure that your construction and house framing plans meet these requirements. Residential building codes vary with states and municipalities so it is important to check with your local building and fire inspectors. Of particular concern to them will be items such as ingress and egress from the house, as well as ceiling heights, door and hallway widths and the window sizes used in the house. In addition, they will want to understand your plans for fire alarms, sprinkler systems, and other safety systems within the home. It is critical to pull all necessary building permits before starting construction. Not only is it the law, it is also extremely beneficial to you and your home. As part of the permit process the building inspector will review your complete set of plans and assess that the home will indeed be constructed to local and national building codes. In many cases the building inspector will provide advice on problem areas of your construction plans. Think of the permit process as an independent audit of your construction plans and an insurance policy on your financial investment. The last thing you want to do is frame a house without a permit. The building inspector could go as far as to tell you to tear the entire structure down due to lack of proper permits. After the house framing is complete, and before any other work begins on the home, the building inspector should be called out to inspect the house framing. When framing a house it is important to use quality framing lumber. Make sure that the lumber is straight and is the appropriate size for the particular sections of the house framing. Learn how to check if a 2×4 is straight. Again, the type and size of house framing material to be used should be specified in your home construction plans that you present to the building inspector for obtaining a construction permit. 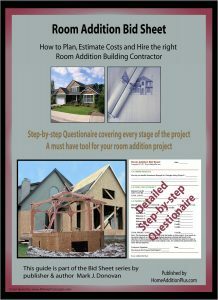 Use this Room Addition Bid Sheet for your construction project and save time and money. It is also critical to use the right type of fasteners (e.g. right size nails or screws) for tying lumber together. If steel beams, engineered lumber, or lally columns are necessary it is wise to make sure that an engineering or architecture firm has specified or approved of the material to be used. Steel beams and engineered wood beams are frequently used to span large openings to eliminate the need for structural support walls. When it comes to house framing, the more you can do on the ground the easier and safer it will be. After framing the deck, frame and sheath walls on the deck and then raise them into place. Make sure, however, to not build walls so large that you and your framing team can not pick them up and put them into place. Also keep your material stacked and covered well. It is vital to protect your framing material from the weather to prevent water damage such as warping and de-lamination. Also order a dumpster to be located on the jobsite to prevent sloppy and dangerous scrap piles from forming around the construction site. Whenever possible try to schedule your house framing during the warmer and drier months of the season. Both you and your construction material will benefit from this type of planning. Make sure you have all the necessary tools for house framing. Key tools are a pneumatic nailer and air compressor, along with traditional hammers, tape measures, framing square, skill saw, reciprocating saw, level, pencil, plumb line and ladders. Also make sure you have safety glasses and work gloves, along with a carpenter’s belt. Use your framing square, level and plumb line constantly during your house framing project to ensure straight, level, and plumb floors and walls. Tilted floors and crooked or leaning walls are permanent problems that impact the quality and the longevity of the home. Also make sure to use glue (e.g. liquid nails) and sufficient and properly sized nails on subfloors to prevent them from flexing and squeaking. Finally, make sure sill plates are properly fastened to the foundation. Again, make sure you check with your local building inspector to see what the proper fastening requirements are, as they can vary depending upon where you live, e.g. earthquake prone areas.